Colombia’s security forces dealt a major blow to guerrilla group ELN on Tuesday, killing 10 alleged rebels and arresting another three in the north of the country. 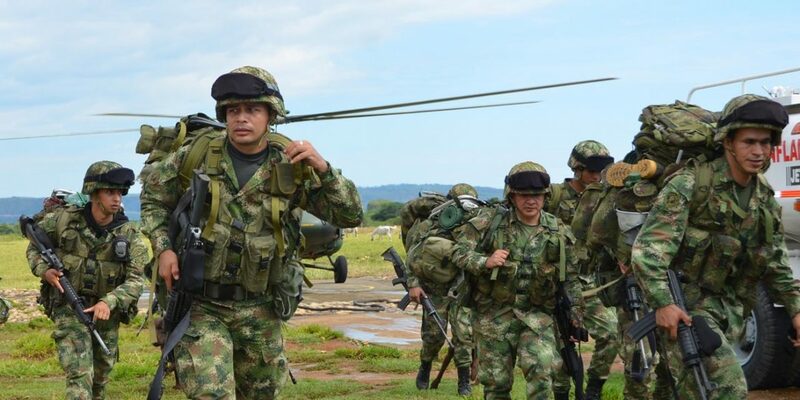 Defense Minister Luis Carlos Villegas said the military operation took place in Caceres, Antioquia. According to the minister, the alleged guerrillas died in an aerial bombing after which ground forces moved in to arrest the surviving rebels. The area around Caceres has seen mass displacement over the past month because of combat between the ELN and paramilitary group AGC. The two groups have been trying to assume control over the region since the demobilization of the FARC, until a peace process last year the country’s largest rebel group. The defense minister said that in the course of 2018, the military has killed and captured almost 200 guerrillas of the ELN, a group that has fought the state since 1964. A ceasefire between the government and the ELN expired on January 9 after the guerrillas carried out several attacks on security forces and oil infrastructure. Peace talks that began in February last year have been suspended. President Juan Manuel Santos said earlier this month he would consider resuming talks with the decades-old guerrilla group if the rebels refrain from carrying out attacks.